Research projects that explore new possibilities for energy storage, reliability, and sustainable development will receive funding in 2017 from the Duke University Energy Initiative’s Energy Research Seed Fund. Seven projects involving 14 faculty members were selected to receive a total of $240,000 from the fund. Seed funding provides a financial head start for new multi-disciplinary, collaborative research teams, enabling them to produce preliminary results that may help them obtain future external funding. 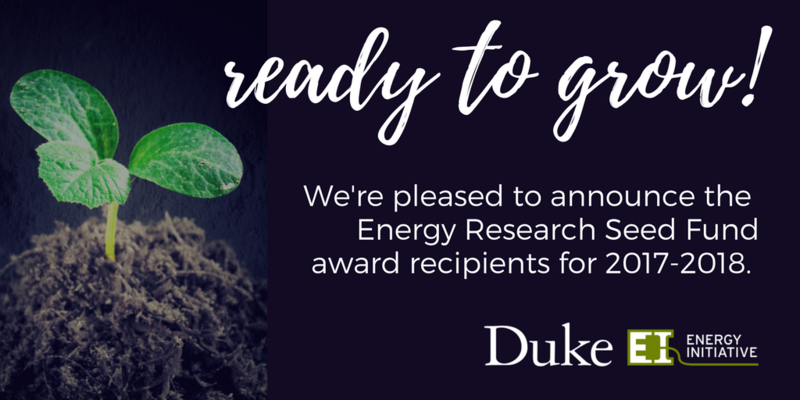 The first three rounds of funding from the Energy Research Seed Fund totaled $700,000 and have generated nearly three times that value in follow-on awards for Duke research to date. The 2017 round of awards is co-funded by the Energy Initiative, the Trinity College of Arts & Sciences, the Pratt School of Engineering, the Information Initiative at Duke (iiD), and Bass Connections. Labs led by Benjamin Wiley and Nico Hotz will replace the traditional carbon nanoparticle-based catalyst and gas diffusion layers of a fuel cell with a nanowire mesh electrode that is at least 10 times more conductive, produces at least three times more electrical current per gram of platinum catalyst, and allows for a greater flow rate of fuel (hydrogen and air) through the electrode. Itaipú Binational Dam is the world’s largest dam in terms of energy production, supplying 18% of Brazil’s electricity and 85% of Paraguay’s. When a treaty expires in 2023, the dam’s energy pricing and distribution agreements are once again up for negotiation. Christine Folch’s team will offer pragmatic policy recommendations for the upcoming renegotiation of the treaty. Solar and wind generation can supply clean power, but effectively storing this energy and delivering it to users is a colossal challenge. Carbon-neutral liquid fuels, made from air and renewable energy, are expected to be an ideal solution. These fuels can be easily stored and transported, and their subsequent use results in zero total emissions. This study, led by Jeff Glass and Weitao Yang, will pursue the electrochemical conversion of CO2 gas to methanol fuel using ionic liquids. Capacitive deionization (CDI) is emerging as a promising water treatment technology that can respond to the world’s growing demand for drinkable water. In a typical CDI process, feed water flows between two electrodes. However, this process is slow at removing salts. This project by Jie Liu and Mark Wiesner will build a flow-through CDI system in which the feed flows directly through electrodes, thus expanding the understanding of flow-through cell performance and providing guidance for future research on system design and operation to enhance salt removal while maintaining energy efficiency. This project by David Mitzi and Aaron Franklin will develop low-electron-affinity buffer layers, deposited principally by atomic layer deposition, to enable new earth-abundant and environmentally-safe photovoltaic technologies at commercially interesting performance levels. Decisions about China’s electricity sector, which accounts for a quarter of the world’s coal consumption and about 10 percent of its CO2 emissions, will have profound and long-lasting implications for the availability and price of energy resources worldwide and the state of our natural environment. For China to meet its own carbon emissions reduction goals while satisfying the energy needs of its economic growth, the government must consider 1) the economic, environmental and reliability implications of energy sources; and 2) key demand-side alternatives such as end-use energy efficiency and demand side management. Dalia Patiño-Echeverri, Ildo Luis Sauer, and Mark Borsuk will work to understand determinants of electricity demand in order to project different demand scenarios at high resolution. The team’s work will be focused on China, but models and tools will be designed to allow for easy replication in research on Brazil, Mexico and Colombia. Jordan Malof and Marc Jeuland’s project will use a novel paradigm for estimating energy reliability that leverages recent breakthroughs in machine learning to process massive amounts of remote sensing imagery providing insights into electricity reliability (e.g., color and nighttime light imagery). If it proves effective, this new approach to estimating energy reliability would be substantially cheaper and faster than existing methods. It would also decrease reliance on local data collection and government or private utility records. This would make the proposed approach more available, affordable, reliable than existing methods, and would allow for investigation of a broad set of questions related to the reliability of energy supplies.